Hurricane Sandy is another reminder of just how incredibly fragile the thin veneer of civilization that we all take for granted on a daily basis really is. Many of the hardest hit areas along the Jersey shore and the coast of Long Island have descended into a state of anarchy. More than 7 million people live on Long Island, and millions more live along the Jersey shore and right now they are getting a taste of what life would be like during a total economic meltdown. At the moment, there are still approximately 4.7 million homes and businesses that do not have power. Officials say that some of those homes and businesses may not have their power restored until the weekend of November 10th and 11th. Meanwhile, it is getting very cold at night. This weekend the low temperatures on Long Island are supposed to dip into the upper thirties. There have been reports of people diving into dumpsters behind supermarkets in a desperate search for food, and there have been other reports of roaming gangs of criminals posing as officials from FEMA or Con Edison and then robbing families at gunpoint once they have gained entrance into their homes. If people will behave like this during a temporary emergency that lasts only a few days, what would they do during a total economic collapse? That is a frightening thing to think about. Most gas stations along the Jersey shore and on Long Island are either totally out of gasoline or they don't have any power to operate the gas pumps. 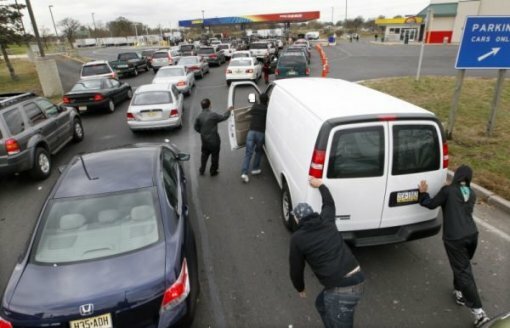 It is estimated that more than half of all gas stations in New York City are closed at the moment, and officials say that more than 80 percent of all gas stations in New Jersey are not able to sell gas right now. So needless to say, the lines at the gas stations that remain open are horrific. "The water went away and these people started walking down the streets and just robbed stores," a pharmacy worker told HuffPo's Andy Campbell. Manager Stan Gutkin said the major heist essentially "breaks the business." "People are turning on each other ~ they're attacking each other," Ocean Towers resident Dena Wells told Campbell. One man blew up an air mattress and floated to City Hall, demanding to know why supplies had not reached residents ~ at least a quarter of homes there are flooded and 90% do not have power. "You know, I went to a shelter Monday night after the storm. People were coming in with no socks, with no shoes. They were in desperate need. Their housing was destroyed. They were crying. Where was the Red Cross? Isn’t that their function? They collect millions of dollars. Whenever there’s a drive in Staten Island, we give openly and honestly. Where are they? Where are they? I was at the South Shore yesterday, people were buried in their homes. There the dogs are trying to find bodies. The people there, the neighbors who had no electricity, were making soup. Making soup. It’s very emotional because the lack of a response. The lack of a response. They’re supposed to be here….They should be on the front lines fighting, and helping the people." That is why I am constantly pounding on the need to prepare for what is ahead. There are signs of social decay all around us and most Americans are not equipped to deal with the pressures that come with a major emergency. When things totally fall apart, you don't want your family to be totally unprepared and surrounded by millions of angry and desperate people. Hopefully Hurricane Sandy will serve as a wakeup call for millions of American families. Time is definitely running out, and we all need to get prepared while we still can.